Product Description For determination of flash and fire points of liquids at temperatures of up to 325°F (163°C) and flash points of cutback asphalts at temperatures of less than 200°F (93°C). Determines Tag Open-Cup flash point of liquid products and cutback asphalts. 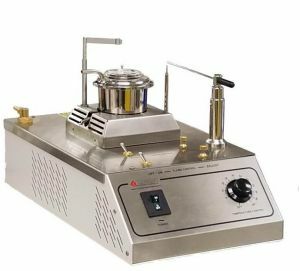 Includes sample test cup, plated brass liquid bath with constant level overflow, pivoting ignition taper with pilot light and reference bead, pivoting thermometer holder, heater and base. Electrically heated model is equipped with stepless variable heat control for accurate control of temperature rate of rise per specification. Gas heated model also available.